A sweetheart table is a way for brides and grooms to enjoy their reception with a special spot just for the couple of the hour. They can highlight your own unique style and embrace the theme of the reception in an exclusive way. There are a number of ways you can dress up your own sweetheart table to make sure it’s the only place you'll ever want to sit at your celebration. If your table will be elevated, use the various steps and heights to your advantage. This table has a dreamy and plush floral garland that abounds with blush roses and white hydrangea. Around the table there are numerous glass vases with floating candles for a truly romantic ambiance. For a more intimate and fine art-inspired look, this table features a white linen with a gray linen overlay. A centerpiece with bold dark flowers adds a pop of color, while the tall white tapers bring the softness. Two elegant high-back chairs complete the gorgeous setting. 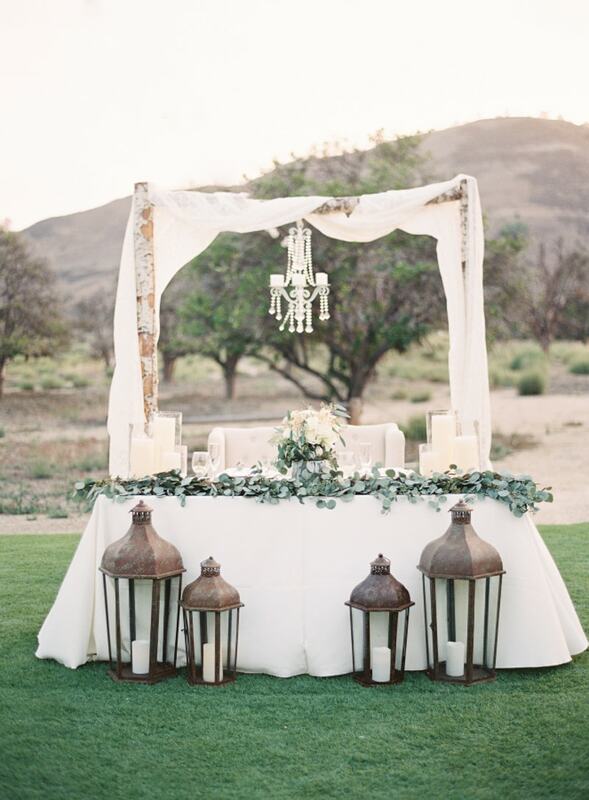 For an outdoor reception, use your arbor from the ceremony to transform your sweetheart table. This fabric-draped backdrop with a chandelier is stunning and looks wonderful behind the white table with its eucalyptus swag and lanterns below. If you’re in love with greenery, a lush swag of greenery draped across and down the table is a beautiful way to bring in a natural accent. This table incorporates the greenery on the table and small nosegays on the chairs. For a personal touch, the couple have their childhood photos tied to their chairs, as well. Don’t forget the sweetheart table isn’t just about the table but what’s behind it. This couple kept their table fairly simple and clean but commemorated their special place with a wall of greenery behind them. In its center is a heart that lights up. Sometimes you don’t even need a bunch of décor; the table can speak for itself. This creative table is an eclectic idea with its knotty and twisted legs. The glass top is accented with a floral centerpiece filled with raw elements and copious greenery. 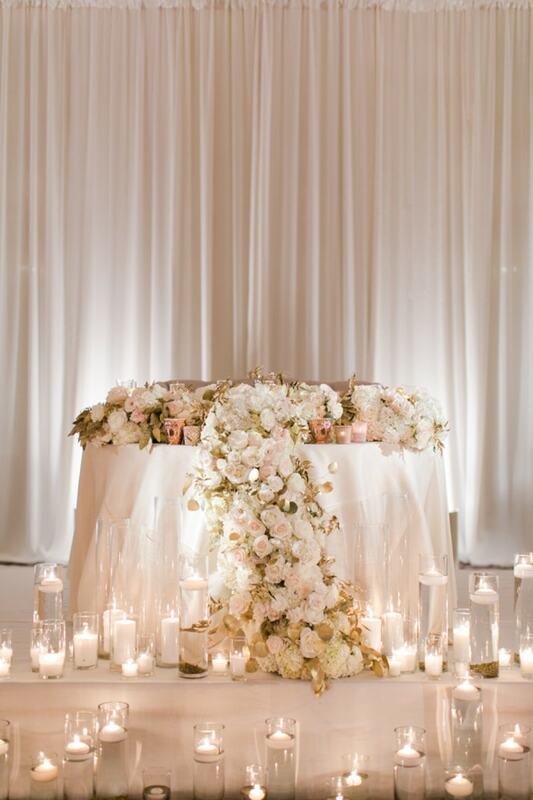 This gorgeous sweetheart table features a glittering linen, candles, the bridesmaids’ bouquets, and numerous glass vases glowing from the floor. Behind it is a floral swag to tie in the backdrop and beautify the space even more. 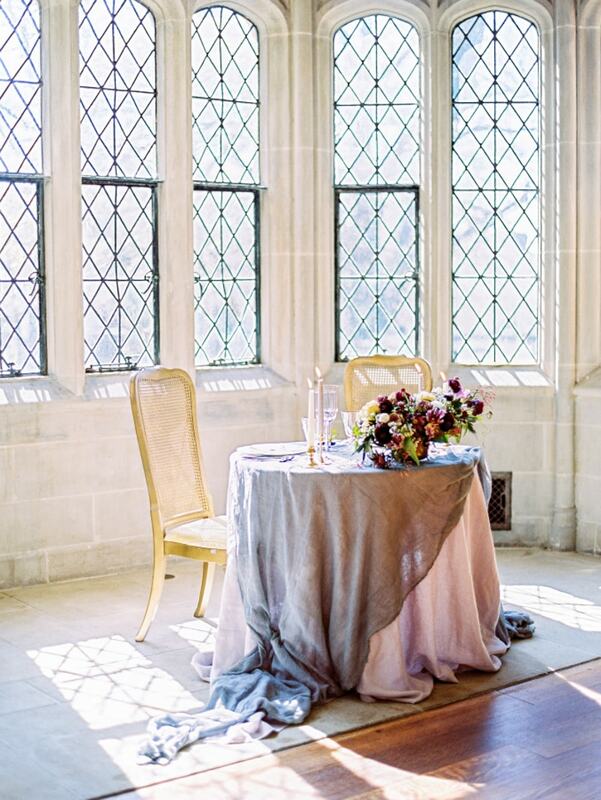 And of course, no sweetheart table is truly complete without chair accents. This blue linen-covered table features a pair of chivari chairs with beautiful coverings. On their backs are signs for the bride and groom: Mr. Right and Mrs. Always Right. 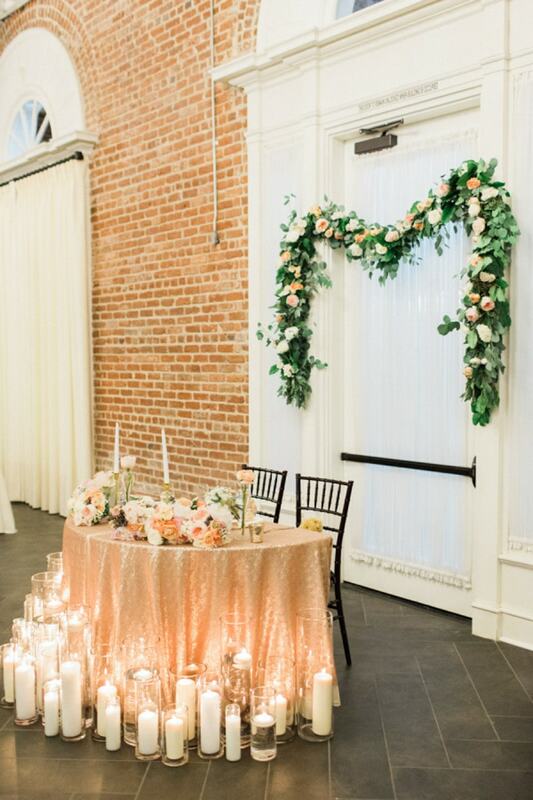 Think of your sweetheart table as an extension of your wedding theme. Put your own personal touch on this special spot to make sure you and your groom have the best seat in the house.